Avoid a trip to Davy Jones’ Locker by planning a boy’s pirate party full of scurvy details guests will love. 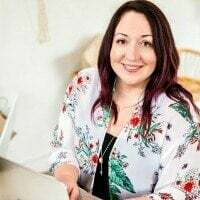 Planned by Julie—a talented follower of Spaceships and Laser Beams—this party will whisk you away to an imaginary life on the sea with treasure chests and plenty of pirate plundering. The dessert table is full of inspiration—from the treasure map backdrop to simple decorations and props to Jolly Roger flag-topped cupcakes and other clever desserts. 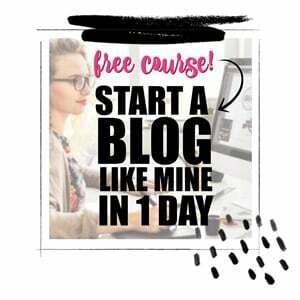 Is a pirate’s life for you? It might be after you see these Pirate Birthday Dessert Table Ideas. Shiver me timbers! 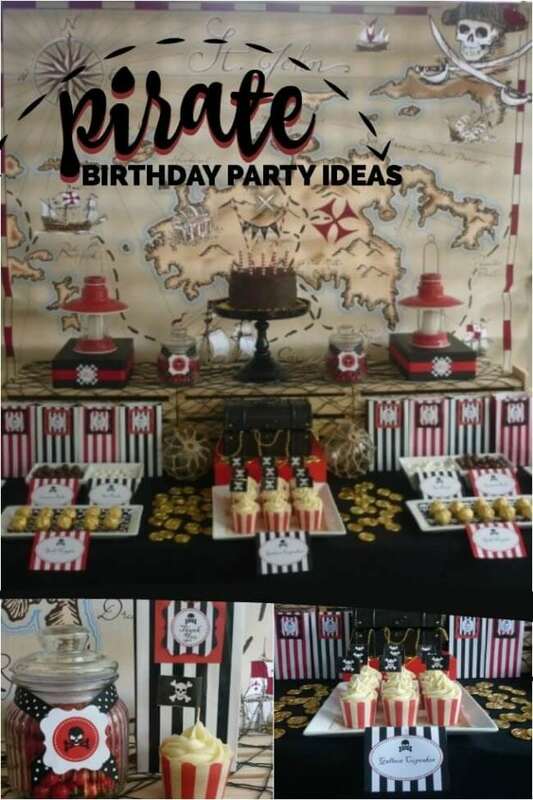 These are some adorable pirate themed birthday party ideas! Nothing excites pirates and treasure seekers quite like a treasure map. I love that Julie used an oversized treasure map (actually a tablecloth) as the backdrop for her dessert table. I bet it brought all the guests to the table. The colorful map helped to set the predominant black, white and red color palette for the party too. You’ll notice the color scheme carried out through the use of many fun party products (bags, cupcake wrappers, candles). Wooden crates covered in fish netting were a creative addition to the table and helped provide an extra level to display sea-inspired props and yummy desserts. Red lanterns were perched on gift- wrapped boxes to add needed height. Small glass jars, decked out in themed printables, housed red candy. A simple chocolate cake topped with festive striped candles was accented with a little “Ahoy” bunting attached to paper straws. I love how gold coins were scattered at the base as a subtle nod to the party theme. Hopping down to the lower level of the dessert table reveals a sea of treats! A treasure chest overflowing with gold necklaces set the scene. Trays topped with pirate themed pattern paper gave way to gold “nuggets”, scrumptious looking “galleon cupcakes” served in eye-catching red and white striped cupcake wrappers. Bottles of red pirate punch with printable labels add a great touch and help tie the theme together. Milk and white chocolate candies were displayed in candy dishes creatively labeled “cannon balls” and “sea pearls”. Clever food labels add such an element of fun to a party theme! 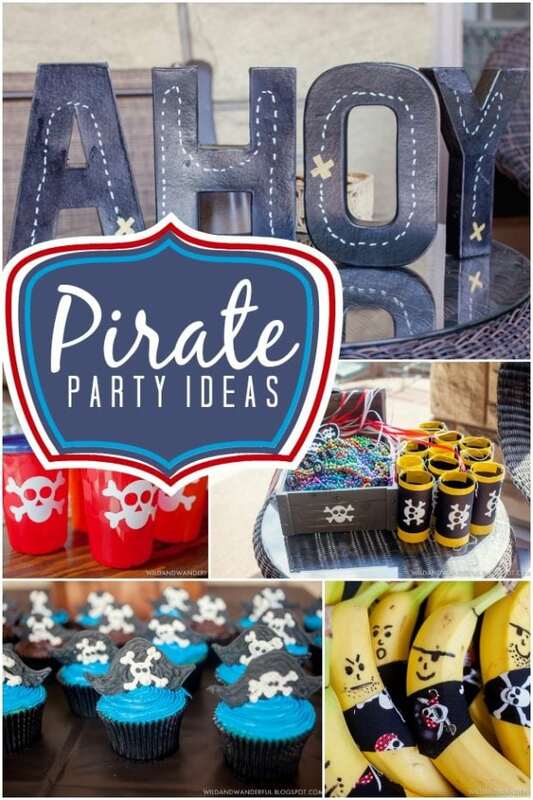 I don’t know about you, but “X” would definitely mark my spot at this boy’s pirate party dessert table: I’d love to go plundering for a treat or two!